HELP RECORD OUR LABOR HISTORY! Interview a fellow worker, a respected leader, a community activist, a family member, so that what they have been through and managed to accomplish is not lost down the drain of time. Make it available* – to inform and inspire, to caution and counsel future generations. Take part in this training workshop presented by the Oregon branch of the Pacific Northwest Labor History Association. Workshop entrance is in the rear of the building, on Belmont St., where there is a small parking lot. Union member? Ask your union to sponsor you. *OLOHP oral histories are archived at the Oregon Historical Society. The 48th annual conference of the Pacific Northwest Labor History Association, held May 20-22, 2016, in Portland, was well received based on word-of-mouth comments and evaluations completed by 30 of about 125 participants, including 114 paid registrants. What did they like least? More than one respondent complained that there were too many good presentations to choose from. Some complained that there was not enough diversity: “Overall, it’s still a very white-person focused perspective, I can see that there’s an effort being make to change that, but [there’s] a long way to go.” Others said the conference needed more youth involvement. One suggested that the PNLHA sponsor a scholarship for high school and university students to attend the conference. Another proposed an essay or speech writing contest with the winner coming to the conference. Twenty-six respondents gave the presentations an overall rating of “excellent” or “very good.” One respondent said they were “top notch” and another said they were “worth the price of admission.” Some were disappointed that they could not attend all the presentations. Sharing top honors for the favorite presentation were British Columbia filmmaker Neil Vokey’s U.S. premiere of Goodwin’s Way, University of Colorado (Denver) instructor James Walsh’s presentation on the Romero Theater Troupe, and University of Wisconsin scholar Andrew Wolf’s “The Living Wage and the Articulation of Working-Class Citizenship, 1920-1970.” The climate change roundtable discussion, the literature of labor, “Labor history: old style and digital style,” also won praise as did Gwen Trice’s presentation on African-American loggers, Steve McQuiddy on conscientious objectors in Waldport, Oregon, during the Second World War, Pacific University’s Larry Lipin on class and wilderness management, and PNLHA trustee Ryan Wisnor ‘s “The Trees Saved Them,” a unique angle on the historic 1934 longshoremen’s strike. Oregon First Nation’s leader Carolee Morris, a member of the Cowlitz First Nation tribal council, welcomed participants to our Friday night reception. She was followed by Portland band General Strike that brought the evening to a close with a rousing round of Solidarity Forever. Both the Saturday and Sunday plenaries were well attended and received favorable comments. Saturday’s keynote session garnered the most votes for “favorite presentation.” Sunday’s plenary won praise both for Washington State Labor Council president Jeff Johnson’s incisive comments on the need for labor to work for positive answers to climate change problems, and for the use of Skype to allow labor/environmental author Jeremy Brecher to respond. About 100 participants attended the banquet and awards ceremony. Participants applauded the food and the unionized staff that provided it. 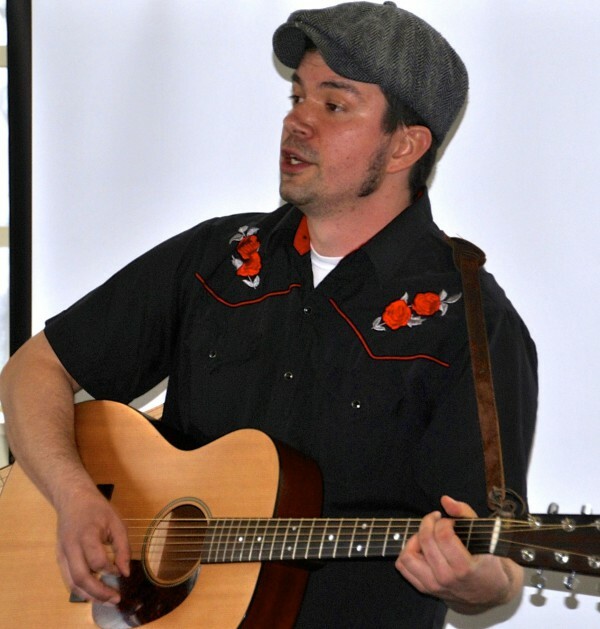 They also enjoyed Bellingham, WA, musician Dana Lyons who set a positive and participatory tone for the evening with his first set, featuring his trademark Cows with Guns song. Strassmaier. Conference participant Dr. Larry Morgenstern attended to Edgington along with nurse Maurge Dulaney as well as presenter Joanne Ursino. An ambulance team also examined Edgington and reported only minor injuries. The unfortunate incident disrupted the evening but a second musical set by Dana Lyons provided some tension relief for the remaining conference attendees. Edgington’s co-recipient Senator Dianne Rosenbaum was to receive her award on June 3. A future date will be set to present the History Maker of the Year Award to the Rural Organizing Project. Three musical groups – Portland’s General Strike, Eugene’s Monday Morning Denial, and Bellingham, WA’s Dana Lyons were all applauded. As one evaluation noted, “The incredible music programming conveyed not only entertainment, but also the integral part it has played in the history of the labor movement.” Oregon trustee Nathan Moore, working with sound technician Dennis Soper, also playing harmonica with Monday Morning Denial, ensured that the music was technically excellent. Nathan also worked closely with Oregon trustee Ryan Wisnor who acted as liaison with the conference facility staff. There were 28 co-sponsors, three of which came after the conference ended. In-kind contributions included union photocopying of the kit materials by SEIU Local 503 members from the Labor Education and Research Center (LERC) at the University of Oregon as well as the free printing of the colorful conference brochure that appeared in all conference kit folders. Thanks to Portland’s union printer, Morel Ink. A poster with the names of conference co-sponsors was displayed throughout the conference and several announcements were made to thank them. The names also appeared at www.pnlha.org. The conference hosted about 10 exhibitors, including several booksellers, a photo display, a solidarity quilt raffle, and a Columbian workers table. Choosing to have the exhibits arranged around the Friday reception room added much color to the proceedings. The conference strongly benefitted from the volunteer work of the following people: Program coordination – Marcus Widenor; Venue/catering – Lane Poncy; A/V-Internet-Skype ­– Ryan Wisnor; Awards – Jim Strassmaier; Registration – Bruce Nelson and Carolyn Matthews; Exhibitor displays – LisaMary Wichowski; Photography and design – Leola Jewett-Verzuh; Music coordination – Nathan Moore; Overall coordination, fundraising, publicity, and conference kit development – Ron Verzuh. Judging from the written evaluations and verbal comments during the conference, the event was a programming success. Several participants were inspired by the proceedings and have pledged to attend future PNLHA conferences. The accident during the awards ceremony represented a flaw in the management of the event. As noted on several evaluation forms, needs of the elderly must be fully addressed in future. The conference was an overall financial success and all conference volunteers deserve a vote of thanks as do all our co-sponsors. Note: More conference photos will be posted to a gallery section of our site. Sandy Ellis taught school for fifteen years before being elected President of the Oregon Education Association (OEA) at the age of 36. She led the OEA through important changes including implementation of affirmative action and a merger with classified employees. Ellis provided leadership at both the local and state level. 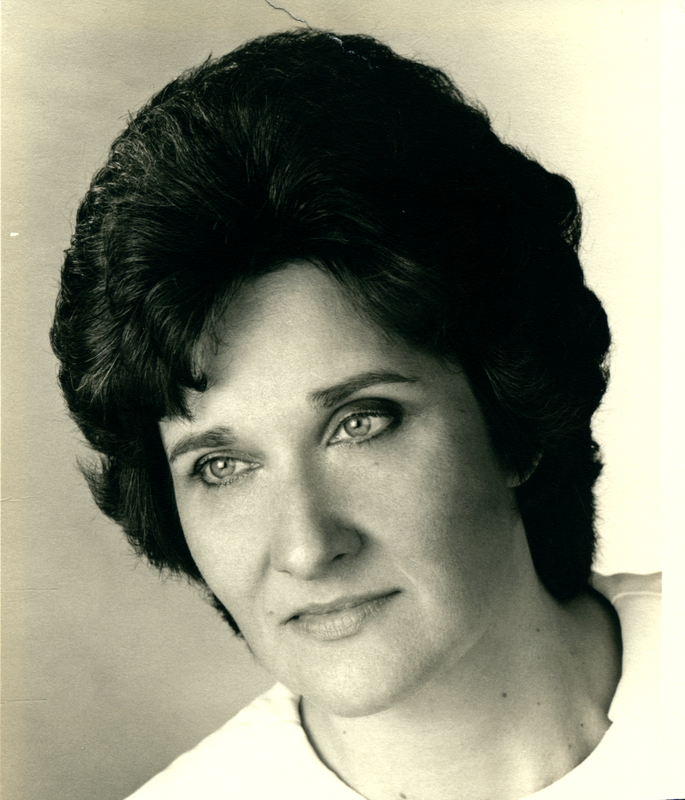 Now listen to excerpts from her oral history conducted by the Oregon Labor Oral History Program. For more information about sponsoring an oral history or to volunteer for interviewing, research, or transcribing contact former Oregon PNLHA VP Carolyn Matthews matthews.carolyn.k@comcast.net or trustee Jim Strassmaier strassj@spiritone.com. 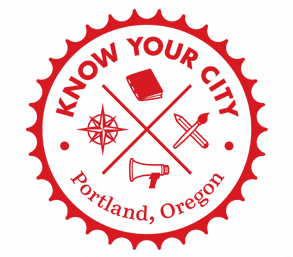 Know Your City invites you to its May Day inspired People’s History of Portland walking tour. A People’s History of Portland highlights the roots of Portland’s downtown immigrant and working class communities, and celebrates the ongoing decades of social justice leaders and grassroots movements. Before Portland was known for Portlandia, the foundation of the city was built by immigrant labor. This tour tells Portland’s story from the viewpoint of Chinese people, Japanese people, African American people, Jewish people, and LGBTQ communities, whose histories are often left out of the mainstream. A People’s History of Portland tour challenges you to take a closer look at Portland and how we got to where we are today. Our special May Day themed tour includes new sites of significance that are important places for labor activism and direct action; and will be led by local historian Ryan Wisnor, whose work focuses on labor and working-class history as documented through oral histories. He also serves as a Trustee for the Pacific Northwest Labor History Association (PNLHA) and is a Masters student in History at Portland State University. Eugene-based Oregon trustee Nathan Moore and partner Kate Dowling have released Scoundrels That We Are, a five-song extended play digital recording. The EP will be “To the delight of clock-punchers, sleepy-eyed wage slaves, and rabble-rousing folk fans everywhere,” says a news release. 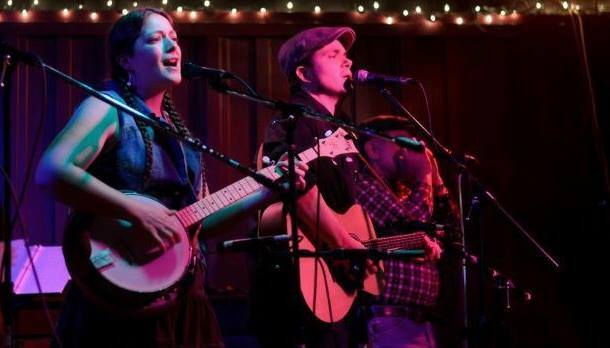 Nathan and Kate recorded the EP as Monday Morning Denial, “Oregon’s ‘working class folk’ duo.” Topics discussed in the songs include 19th century anarchism, the Great Depression, fishing, gentle parenting, and the founding of the ILWU. 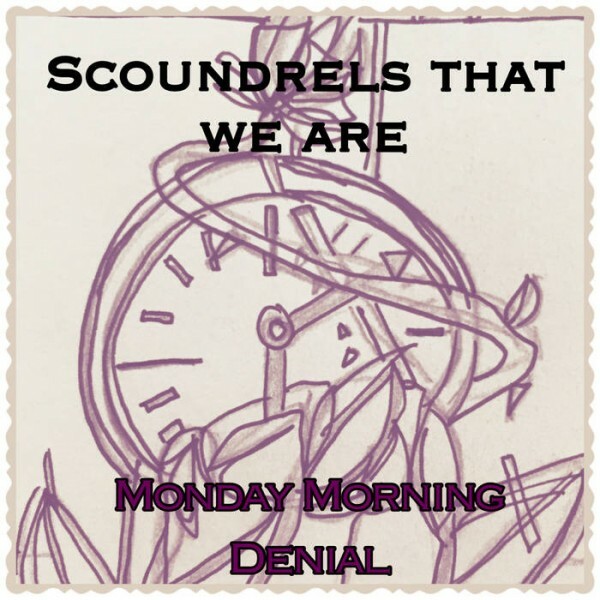 The EP is available as a free digital download on Bandcamp, an online music site that provides a platform for independent artists: http://mondaymorningdenial.bandcamp.com/releases . “Historically, organized labor has led efforts to create an economy that works for everyone,” the brief states. “Unions represent the fundamental right of workers to stick together and demand better pay and working conditions. “Union efforts have resulted in worker protections such as child labor laws, safer working conditions, overtime compensation and the 40-hour work week. Following World War II, a vibrant U.S. labor movement helped support the development of a broad middle class by setting standards for wages and benefits. 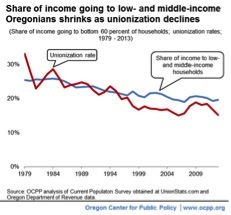 “By the late 1970s, at about the time union membership began to decline nationally and in Oregon, income inequality began to widen. Income gains began bypassing most Oregonians, flowing instead to those at the top of the income scale. The decline in union representation is an important part of the story of the rise of income disparities in Oregon, and of disparities among Oregon men in particular. For more go to http://www.ocpp.org/2015/09/02/20150902-unions-income-inequality-oregon/ or download the brief: Unions Are Key to Reducing Inequality . Thanks to PNLHA trustee Jim Strassmeier for sending the brief to Oregon Update. Oregon trustees Ryan Wisnor and Nathan Moore were guests on Portland radio station KBOO’s Labor Show in October. Hosting the show were PNLHA secretary Lane Poncy and member and author Susan Stoner. One of the topics: Why they joined the PNLHA. Oregon trustee from Portland Ryan Wisnor. For Ryan, the PNLHA “has a lot to offer folks who are younger, who are in unions, but also folks who are in non-unionized workplaces.” Ryan said that for him, “the association has brought me in contact with a generation of workers who have gone through struggles similar to the ones I experience in my day to day life.” Ryan’s specific interest is oral history, so that was another draw to the association. Oregon trustee from Eugene Nathan Moore. For Nathan, a labor history specialist in the music of longshoreman Harry Stamper and others, the PNLHA “was the perfect place for me to present my information.” Nathan added that he “liked the mix of academic folks and…regular folks who are just interested in history, workers, etc. It wasn’t a boring old academic conference.” Nathan also performs as a musician at PNLHA events. To hear the full interview: http://kboo.fm/laborradioon083115 . Our affiliate membership to Portland Jobs with Justice was unanimously approved by the steering committee at its August 3 meeting, reports trustee Ryan Wisnor, our representative at JwJ. Oregon trustees had agreed to the affiliation and a $100 financial contribution at their June meeting, but before the decision was made to accept our affiliation, Ryan attended three JwJ meetings as a guest. On August 3, some JwJ members complimented the PNLHA on the June 11 Bloody Wednesday event, while others asked how the PNLHA could help members look into their union’s history. Ryan has agreed to continue attending steering committee meetings and will provide a short report each month for Oregon Update on JwJ happenings. He also plans to arrange a meeting between Oregon PNLHA trustees and JwJ committee members. For more on the Portland JwJ, ryanwisnor@gmail.com. PORTLAND — Pier Park in St. Johns is typically a destination for disc golfers on a sunny Saturday afternoon, but on July 11th seventy-five people turned out to the park for a guided historical walking tour commemorating Portland’s “Bloody Wednesday.” Eighty-one years ago on this day Portland police fired upon unarmed strikers during the 1934 Maritime Strike wounding four men, hitting several trees, and infuriating the general public. The event was hosted by the Pacific Northwest Labor History Association (PNLHA) and received support from three International Longshore and Warehouse Union (ILWU) locals, Portland State University’s Department of History, Portland Jobs with Justice, and community groups of the St. Johns neighborhood. 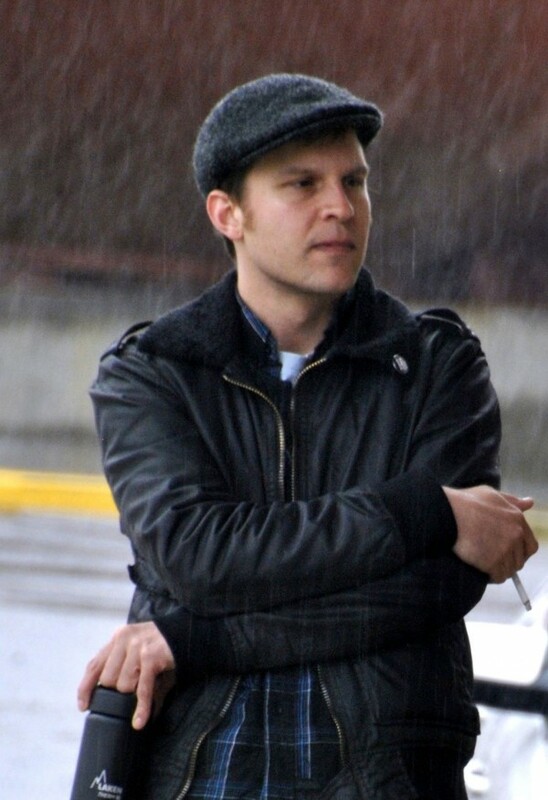 Portland State University master’s student of public history Ryan Wisnor organized the event based upon his research on how the labor community accredited the trees of Pier Park for shielding the workers during the shooting. The Low Tide Drifters, Eugene’s premiere roots band, were the subject of a half-hour discussion about their music, their passions, and their labor-oriented politics on Portland radio station KBOO’s Old Mole Variety Hour. Oregon trustee Nathan Moore, his partner Kate Dowling, and Chico Schwall joined host Norm Diamond, another Oregon trustee, for a lively and informative talk punctuated by some of the group’s best-known tunes performed live on air. Listen to the July 6 broadcast here: http://kboo.fm/lowtidedriftersunderdogfolkmusic . For a further taste of LTD’s “underdog folk music: https://www.youtube.com/watch?t=10&v=1au_STyB2IY .